BERKELEY COUNTY, S.C. [MONDAY, FEB 11, 2019] Berkeley County had three of South Carolina’s top economic development announcements in 2018, according to the state’s Commerce Department, which tallied nearly $4.2 billion in projects last year. A $600 million expansion of search engine giant Google Inc.’s data center in Moncks Corner was the year’s biggest announcement in terms of value, according to the state agency charged with recruiting industry. The facility, one of only a handful of data centers the technology giant runs in the U.S. , is part of the backbone that keeps services like Gmail and Google Drive online. J.W. Aluminum’s announcement of a $255 million expansion of its Goose Creek campus ranked fourth in value. The expansion, scheduled for completion in 2020, includes a new 220,000-square-foot building and state-of-the-art equipment to make flat-rolled aluminum for the construction and other industries. “Additional planned investments will bring the total investment in Goose Creek to over $300 million and make our South Carolina facility one of the most technologically advanced continuous cast plants in the world,” said Stan Brant, the company’s chief operating officer. W International, a welding and fabrication firm doing work for defense projects like a next-generation Navy submarine, finished No. 3 on the Commerce Department’s list for the year’s top job creation announcements. The company plans to hire 600 people at its Charleston International Manufacturing Center site near Goose Creek. All told, the state’s new projects totaled 14,071 jobs. The top job creator was RoundPoint Mortgage Servicing Corp. which is bringing 1,100 jobs to a new corporate headquarters in York County. This year’s recruitment list includes industries from the metal, automotive, plastics, chemicals and agribusiness industries as well as corporate office jobs. Since 2011, the year Hitt became Commerce Secretary, the agency has recruited $35,6 billion in capital investment by new or expanding businesses. More than 60 percent of the jobs created last year were by new businesses while the rest were from expansions of existing businesses. United States firms represented three-fourths of the investments by dollar value, followed by German companies at 5 percent and Chinese businesses at 4 percent. Berkeley County was the only county to land at least three projects on the annual list. Spartanburg County had two announcements, including a Keurig coffee roasting and packaging facility that was the state’s second-biggest investment and fourth-largest job creator. [January 28, 2019] – Berkeley County Economic Development and SC Works Trident in partnership with the Town of St. Stephen and St. Stephen Elementary School will be hosting a Community Job Fair on Wednesday, February 27, 2019. The event will be held at St. Stephen Elementary, 1053 Russellville Road, Saint Stephen, SC from 1:00 pm until 4:00 pm. Employers from various fields throughout the Tri-County area will be on-site to meet potential employees. Come Prepared – Please bring copies of your resume and come prepared for an interview. Computers will be available for you to immediately apply online. There will also be a number of community organizations present so you can learn more about the available resources for workforce development and how to enroll for training that equal employment opportunities including the new ManuFirstSC certificate. Please Register – There is no fee to participate. Space is limited, however, and will be available on a first-come, first-serve basis. Tables and chairs will be provided. Please feel free to bring your company’s table cloth and other marketing materials. Employers must be registered with SC Works and have active posted jobs on the SC Works website in order to participate. All jobs must be direct hires. We will contact you approximately one month following the event for feedback regarding those hired by your company. If your company is interested and has positions available, please complete a Job Fair Participation Form and return it by email to [email protected], no later than 2pm, Wednesday, February 13, 2019. We look forward to seeing you at the job fair! COLUMBIA, S.C. [January 3, 2019] – VTL Precision, a leading developer and manufacturer of precision-engineered engine, transmission and turbocharger components for the commercial vehicle and passenger car markets, is locating new operations in Berkeley County. The company’s $8.2 million investment is projected to create 10 new jobs. The company’s new facility will be located at the Crowfield Corporate Center in Goose Creek, S.C.
For more information on the company, visit www.vtl-group.com. BERKELEY COUNTY, S.C. [TUESDAY, DECEMBER 11, 2018] – W International, a full-service manufacturer of large, complex, welded metal fabrications, today announced plans to locate new production operations in Berkeley County. The company’s $35.2 million capital investment is projected to create more than 600 new jobs. Located at the Charleston International Manufacturing Center at Bushy Park, W International’s new, 451,000-square-foot facility will provide manufacturing, custom fabrication, project management, tooling and engineering services to clients in the aerospace, defense, automotive, energy and commercial business industries. Hiring for the new positions is projected to begin in January 2019, and interested applicants can visit the company’s careers page online. According to a press release with on the Company’s website, a second phase will begin soon which could provide more new job announcements in addition to the 600 new jobs already projected. W International is funding two new welding training programs at Cross and Timberland High Schools to train high school students as well as adults in partnership with Berkeley County’s Department of Adult Education. Located at Bushy Park Industrial Complex, the company’s new, 451,000-square-foot facility will provide manufacturing, custom fabrication, project management and more to a variety of clients. 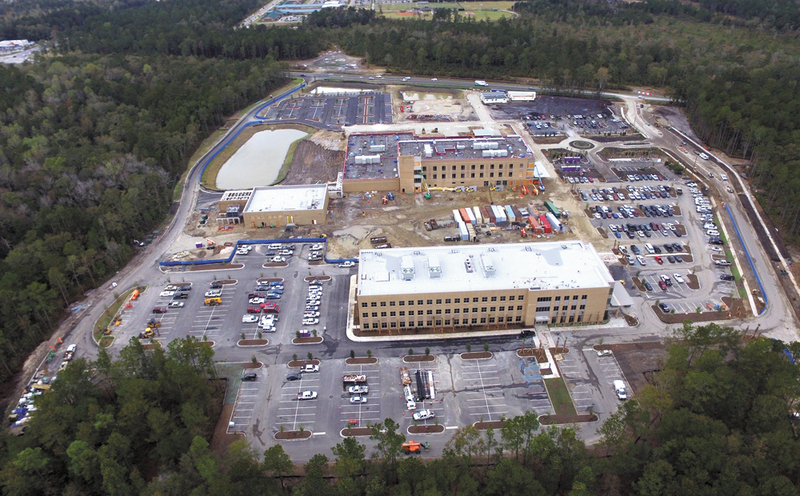 Monday, December 10, 2018 – Roper St. Francis Healthcare has opened its new Berkeley County medical office building, half of the hospital system’s new Summerville campus. “Our strategy in developing our health care system revolves around serving residents closest to where they live and work,” President and CEO Lorraine Lutton said in a news release. Doctors will rotate into the medical office building based on patient need. Elisa Cooper, director of property management for Roper St. Francis, said 12 doctors will work out of the building initially, but at least 100 doctors could eventually be rotating in and out of the practices housed there. “We are bringing the health care to the community instead of having the community fight to come to us,” Cooper said. The first floor of the building can house classrooms, as well as radiation and oncology departments. The second and third floors are occupied by examination rooms and offices for doctors and hospital administrators. The office building will be connected by a covered walkway to the new, 140,000-square-foot, 50-bed Roper St. Francis Berkeley Hospital, scheduled to open in October. This will be Berkeley County’s first new hospital in more than 40 years.Dr. Kenosha Gleaton, whose practice is based in West Ashley, said she decided to work out of the hospital’s office building one to two days per week. Gleaton previously worked out of Roper St. Francis’ Moncks Corner office for that reason. “It allows our Moncks Corner patients to have less of a drive than our West Ashley office, but it also allows us to be able to serve the Summerville patient population and to make sure that we’re here to support the hospital,” Gleaton said. Cooper said the Berkeley Hospital campus also has the capacity for another medical office building as the community continues to grow. “We’re committed to Berkeley County,” she said. Source: Charleston Regional Business Journal – Reach Patrick Hoff at 843-849-3144. For more information or assistance with the application process, contact Sharon Goss, Workforce Development Director, SC Works Trident at (843) 529-0400 ext. 203 or via email at [email protected]. Please visit tridentscworks.org or bcdcog.com for information and an application. The demand for workers in high-tech lean manufacturing is expected to continue to surge in the Lowcountry in the coming years and Trident Technical College’s Division of Continuing Education and Economic Development is gearing up to train the employees that can fill those jobs. The college has modified its Lean Manufacturing program, originally developed in conjunction with local manufacturers to provide workers with the equivalent of one year of manufacturing experience, to conform to the state of South Carolina’s ManuFirstSC Grant program. The ManuFirstSC Grant program completely covers the cost of tuition, background checks and drug screening for a total of 84 participants for Trident Tech’s ManuFirstSC (Lean Manufacturing) continuing education classes running from January to May 2019. Grants are awarded on a first-come, first-served basis. The Charleston Metro Chamber of Commerce 2018 Talent Demand Study projected nearly 35,000 new jobs are being created in the Charleston Metro area within the next five years and approximately 18 percent of those are production or mechanical in nature. Additionally, it noted the demand is surpassing local graduate output by 300-500 positions. The ManuFirstSC Grants and Trident Tech’s Lean Manufacturing program can help train Lowcountry residents to fill that void. Interested students should attend the free information sessions to get more detailed information about all of the requirements. For additional information, visit www.tridenttech.edu/ce and click on Funding Opportunities or call 843.574.6152. Concept Sharing (25%) – Readily sharing the training success with other companies. On October 5, 2018, The South Carolina Chamber of Commerce celebrated the winners of the S.C. Manufacturing Employee of the Year Awards with an awards luncheon and panel discussion regarding the future of manufacturing in South Carolina. The 2018 Manufacturing Day Celebration, presented by Jackson Lewis P.C., recognized the important contributions honorees have made to their employers, customers and communities. Amanda Lovin, Supply Chain Manager, Volvo Cars US, was awarded this honor in the Support Category for a Medium-Sized Company. Oct 16, 2018 – Berkeley County joined industry leaders today to cut the ribbon and celebrate Evonik Industries’ new chemical plant in Goose Creek. The precipitated silica plant will supply the tire industry. The plant will result in $120 million investment and 50 new jobs. Evonik adds to our international family, bringing a German company to Berkeley County. Berkeley County Economic Development Director Barry Jurs spoke on behalf of the County, welcoming Evonik to the Berkeley County family, celebrating a promising future in Goose Creek. Jurs was joined by David Riley, the Senior Vice President of Global Specialty Silica, and Business Line Silica North America, Dr. Harald Schwager, Deputy Chairman representing Evonik Industries, Dr. Johannes Ohmer, Managing Director, representing Evonik Resource Efficiency, Mandy Brawley from South Carolina Department of Commerce, and Ralph Walker from Pacolet Milliken Enterprises. Many spoke on the sustainable energy and efficient solutions offered at the plant and its tremendous innovative strength. Welcome to Berkeley County, Evonik! Read more about Evonik’s investment in Berkeley County here. Sign-up and information session scheduled October 9 at 5 p.m.
MONCKS CORNER, S.C. – (Monday, October 1, 2018) Berkeley County will host an information meeting to provide training for manufacturing positions on Tuesday, October 9th at 5 p.m. The meeting will be held at Trident Technical College Berkeley Campus. It is open to Berkeley County residents looking for manufacturing jobs. Berkeley County worked in partnership with Trident Technical College, South Carolina Department of Commerce, Volvo Cars, and Ready SC to start the pilot program in May of 2017. The pilot program saw 155 people graduate from the Lean Manufacturing course, which put them on the path to land manufacturing jobs at major industries around the County, including Volvo Cars in Ridgeville. Since then, neighboring counties have emulated the training program to provide opportunities for residents around the state with over 600 graduates in the Tri-County area. South Carolina Department of Commerce has rebranded the program to ManuFirstSC and will be working to standardize the curriculum for the certificate to be offered at all South Carolina Technical Colleges.